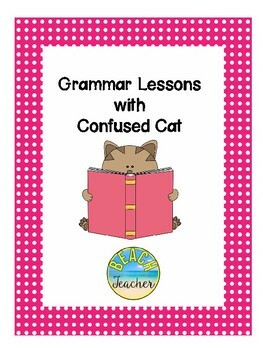 Looking for a product to help you with teaching grammar to younger students? 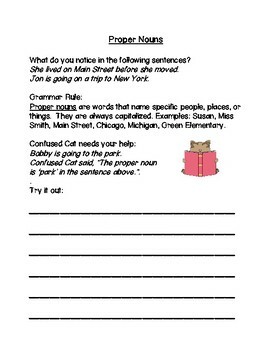 This grammar product can be taught as a unit, or as a weekly lesson throughout the year. 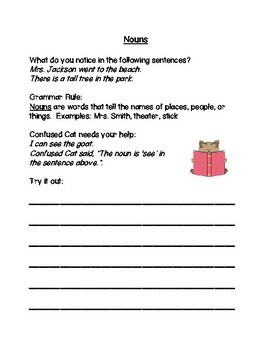 Each lesson includes: sentences to notice the grammar skill, grammar rule, "Confused Cat" who needs to be helped with his grammar mistakes or questions, and a place for students to write a sentence using the skill covered in the lesson. My students keep these in a book form in their writing folders to refer to throughout the year. Please note: I did not write page numbers in case you wanted to order the lessons in your own way. 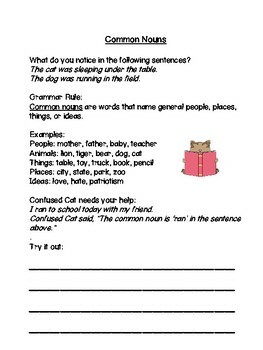 You can view my blog post on this product here: http://primaryclassroomsareoceansoffun.blogspot.com/2013/10/grammar-instruction-and-flash.html.